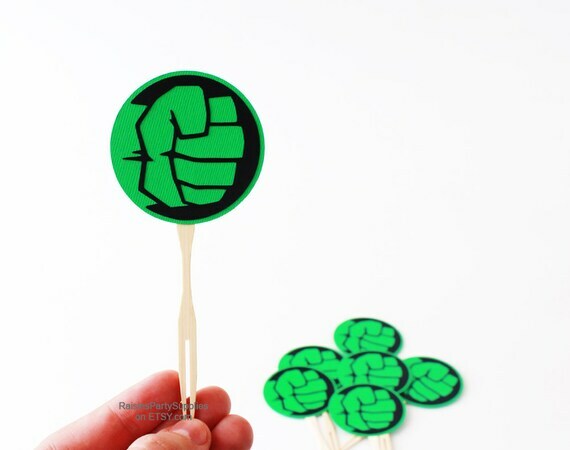 This listing is for Hulk inspired cupcake toppers with options (see dropdown menu during checkout). Each element is up to 4 layers of heavy weight premium cardstock. Very detailed and accurate work. All items are crafted in pet free and smoke free environment. YOU CAN REQUEST CUSTOMIZATION - additional elements, language, DIY set, colors, size etc. 2.25 in (5.71 cm) without a stick. - I can customize this item as you wish. I can send you a photo before I ship out your order to make sure you are happy with your changes (upon a request). - the date on which the order is needed. - the name (in case of adding name). - age (in case of adding age element). If you need this in a rush, feel free to contact me for current processing time! I may have opportunity to speed up the prossesing time or offer you a rush shipping option for an additional fee. Please contact me to discuss this before placing an order. Before purchasing please read my shop policy. You agree to the shop's policies and listing's description once you purchase an item. All copyrights and trademarks of the character images used belong to their respective owners and are not being sold. This item is not a licensed product and I do not claim ownership over the characters used in my designs. This listing is for the time/effort used to create and personalize your item. Please note that due to variations in computer screen settings, the colors as you view them at home may vary slightly from the finished product. Thanks for shopping with Raisins Party Supplies!